The reasons behind the global financial crisis and the Great Recession are the subject of much debate. This is the first book to conclude, on the basis of in-depth analyses of official U.S. data, that Marx’s crisis theory can explain these events. Marx believed that the rate of profit has a tendency to fall, leading to economic crises and recessions. Many economists, Marxists among them, have dismissed this theory out of hand, but Andrew Kliman’s careful data analysis shows that the rate of profit did indeed decline after the post-World War II boom. He shows that free-market policies have failed to reverse that decline. This fall in profitability led to sluggish investment and economic growth, mounting debt problems, desperate attempts of governments to fight these problems by piling up even more debt – ultimately ending in the Great Recession. Kliman’s conclusion is simple but shocking: short of socialist transformation, the only way to escape the ‘new normal’ of a stagnant, crisis-prone economy is to restore profitability through full-scale destruction of the value of existing capital assets, something not seen since the Depression of the 1930s. Doug Lain and I discuss the book on his Diet Soap Podcast #125: Crisis and Capitalism's System Failure. The interview is about 70 minutes long. Clear, rigorous and combatitive. A Failure of Capitalist Production demonstrates that the current economic crisis is a consequence of the fundamental dynamic of capitalism, unlike the vast bulk of superficial, contemporary commentary that passes for economic analysis. One of the very best of the rapidly growing series of works seeking to explain our economic crisis. While recognizing the role that capitalism in general (and the falling rate of profit, a version of surplus-value for Marx) plays in periodic crises, and the role that particular events play in triggering each crisis, Kliman’s account emphasizes the ‘reforms’ adopted in the United States during the 1970’s and 1980’s that offered temporary relief for the economic downturn of that time only to worsen the systemic contradictions that ensure a still bigger crisis the next time around. The scholarship is exemplary and the writing is crystal clear, itself a very impressive achievement for works in this area. HIGHLY RECOMMENDED! Among the myriad publications on the present day crisis, this work stands out as something unusual. Kliman cogently argues against the view of the crisis, held by the conventional left, according to which the present crisis is ultimately rooted in the financialization of the capitalist economy–so that capitalism itself is not in question–and hence still reparable by correcting the financial problems through the abandonment of the neo-liberal policies pursued by the authorities globally. An excellent theorist, Kliman has proved in this work that he is also equally at ease with applied political economy. He ends his book–unusually here again–by refuting the reformist position of many on the left by affirming the need for and the possibility of building an alternative to capitalism–a libertarian society. "The Failure of Capitalist Production is essential reading for all Marxists and lefts interested in what caused the Great Recession. It debunks the fads and fashionable arguments of neoliberalism, underconsumption and inequality with a battery of facts. It restores Marx’s law of profitability to the centre of any explanation of capitalist crisis with compelling evidence and searching analysis. It must be read." In the U.S.: Marxist-Humanist Initiative is currently offering the book for the lowest price around, here. In the UK: Pluto Press is currently offering the book at a discount if you use this link. It is also available from the whole gamut of online booksellers. Pluto needs all these details to be able to be able to process a request. Inspection copies are provided with an invoice that is cancelled if the book is adopted for a course, or returned in a resalable condition. You can also request inspection copies using Pluto’s online form at www.plutobooks.com/lecturers.asp. 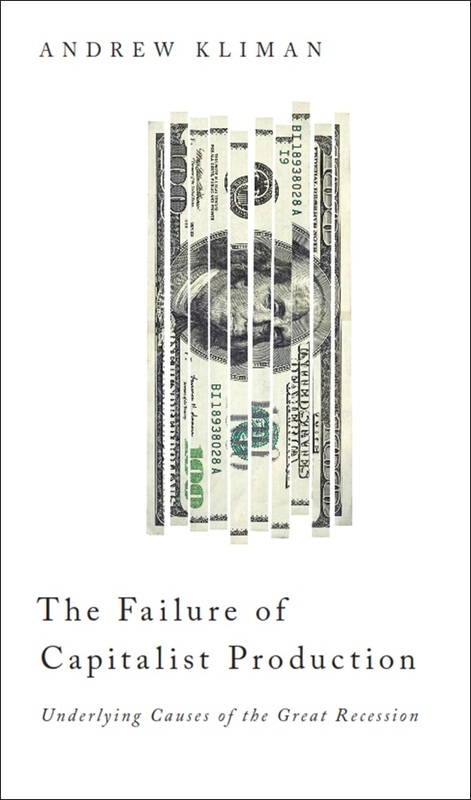 If you would like to request a copy of The Failure of Capitalist Production in order to review it for a journal or other publication, please email Pluto’s publicity manager, Jon Wheatley, at jonw@plutobooks.com, providing your contact details and the name of the publication you intend to review the book for. Copyright © 2005-2012 Andrew ("Drewk") Kliman. All rights reserved.